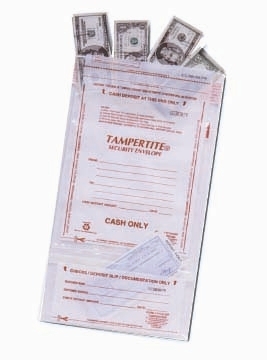 Tampertite dual pouch bags are guaranteed to safely transport your deposit from your point of business to the bank. This dual pouch bag is made with clear specially blended polyethylene film, durable fin-welded side seals, and our exclusive MaxLoc adhesive closure. Every bag comes with it's own serial number and corresponding bar code. The top pouch is for your cash and the bottom for deposit slips & checks which easily separate via a perforation in between the two bags. The lower pouch closure also features resealable tape closure for access to the deposit slips.